I’ve been doing this for a few weeks now and have decided to start sharing this with you, my readers, because the thing I probably find most difficult is coming up with ideas for something different. 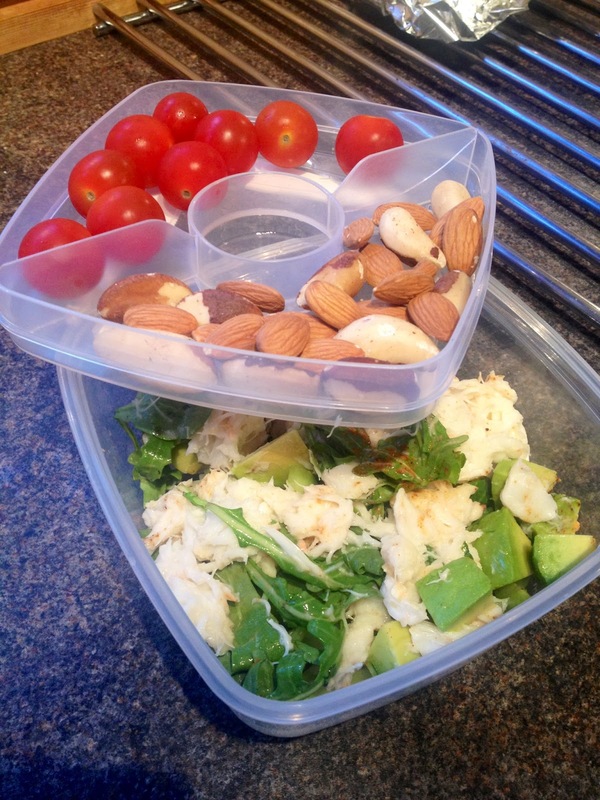 Hopefully this might inspire you to start making your own lunches for the office and give you a few ideas. Don’t worry I won’t be posting my lunch every single day, that could get a bit repetitive, but will try and give you a varied selection of ideas so you don’t have to resort to the old cheese and ham roll everyday! So here’s my first one… crab and avocado salad. 1. Chop up the avocado, cucumber and celery. 2. In a bowl combine the mayo, crab meat and chilli powder and rocket leaves. 3. Place the cucumber, celery and avocado into a tupperware, serve the crab on top and sprinkle over the capers.